Lebanon's Saad Hariri Accepts Invitation To Visit France : The Two-Way Since abruptly resigning in Saudi Arabia, the prime minister has not returned to Lebanon, drawing suspicion he is being held against his will. Now, Hariri's apparently heading to France before Beirut. 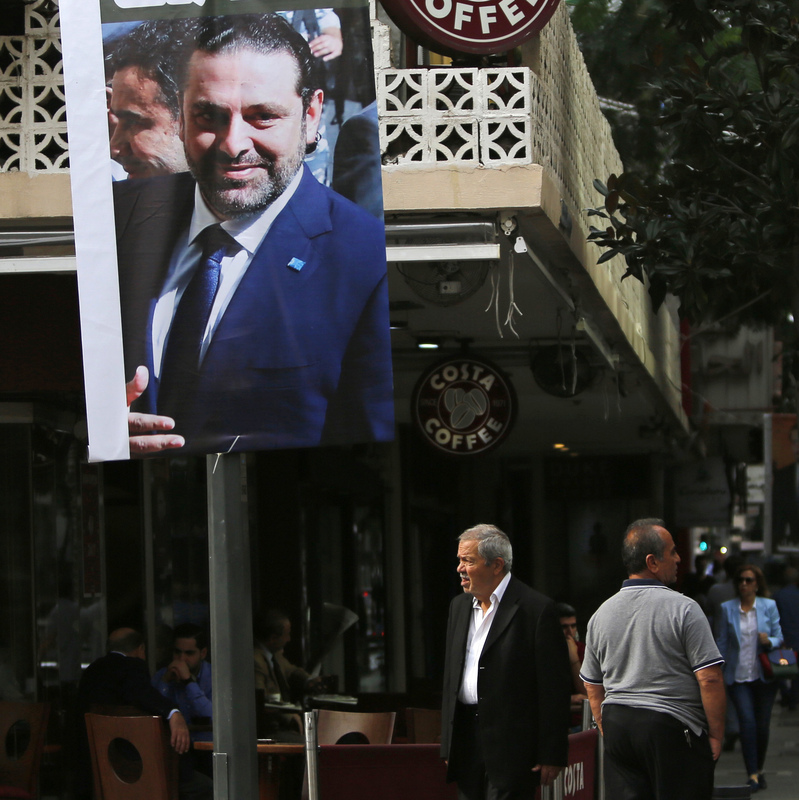 A poster of resigned Lebanese Prime Minister Saad Hariri with Arabic that read, "We are all with you," hangs on a street in Beirut, Lebanon, on Monday. French President Emmanuel Macron's office says that Lebanese Prime Minister Saad Hariri, who abruptly resigned earlier this month while on a visit to Saudi Arabia, has accepted an invitation to come to France. Macron's office notes that the president spoke with Hariri and Saudi Crown Prince Mohammed bin Salman before extending the invitation. Hariri's resignation stunned Lebanon, throwing it into political chaos. Adding to the confusion, Hariri hasn't returned home since his Nov. 4 announcement, prompting Lebanese President Michel Aoun to accuse Saudi Arabia of forcing him to resign and then "detaining" him, a charge the Saudis have denied. On Wednesday, Aoun said that "nothing justified" Hariri's failure to return from Saudi Arabia — but on Thursday, Aoun appeared to accept the prime minister's decision to head to France first. Speaking with Lebanon's state-run National News Agency, Aoun said Hariri will arrive Saturday in France, "where he will rest for a few days" before returning to Beirut to make "a decision regarding the resignation." "We need to have leaders who are free to express themselves," Macron told reporters in Germany, according to The Washington Post. He added that the invitation was not an offer of "exile." As we reported earlier this month, in his resignation announcement from Riyadh, Hariri "lashed out at Iran for meddling in the affairs of 'the Arab world,' saying that Lebanon would 'rise as it had done in the past' and 'cut off the hands that wickedly extend into it.' "
Hariri, a Sunni Muslim, became president late last year as part of a deal that gave some concessions to rival Hezbollah, a Shiite group backed by Iran.